Saudi Arabia’s agricultural development over the last three decades has been astonishing. Large areas of desert have been turned into agricultural fields – a major accomplishment in a country that receives an average of about four inches of rain a year, one of the lowest rates in the world. One of the new areas in which the private sector is investing with government support is aquaculture. The number of fish farms, either using pens in the sea or tanks onshore, has been increasing steadily. Most are located along Saudi Arabia's Red Sea coast. Shrimp farming has been particularly successful. The National Shrimp Company 'Al-Rubian', for example, has a farm south of Jeddah managed by Saudi hydro-biologists and marine engineers, whose shrimp, including the preferred black tiger, is exported mainly to the United States and to Japan. The Kingdom's most dramatic agricultural accomplishment, noted worldwide, was its rapid transformation from importer to exporter of wheat. In 1978, the country built its first grain silos. By 1984, it had become self-sufficient in wheat. Shortly thereafter, Saudi Arabia began exporting wheat to some thirty countries, including China and the former Soviet Union, and in the major producing areas of Tabuk, Hail and Qasim, average yields reached 3.6 tons per acre. This agricultural transformation has altered the country's traditional diet, supplying a diversity of local foods unimaginable a few generations ago. Dates are no longer the vital staple for Saudi Arabians that they were in the past, although they still constitute an important supplementary food. Much of the annual production of dates, estimated at around half a million tons and comprising some 450 different kinds, is used as international humanitarian aid. Several factories, including one in Al-Hasa, are dedicated entirely to the production of dates for foreign aid and donate tens of thousands of tons of dates each year to relieve famine and food shortages, mainly through the World Food Program (WFP) of the United Nations' Food and Agriculture Organization (FAO). Many countries have directly benefited from Saudi Arabia's food aid offered through the WFP, and the Kingdom is second only to the United States in contributions to the program. The progress made by the Saudi Arabian agricultural sector in recent years has been largely due to an array of government programs, including the provision of soft, interest-free loans and technical and support services. The agriculture sector has also benefited from low-cost water, fuel and electricity, and duty-free imports of raw materials and machinery. Foreign joint-venture partners of Saudi individuals or companies are exempt from paying taxes for a period of up to 10 years, and the investment regulations in effect since April 2000 offer further incentives. The primary agency responsible for implementing agricultural policy is the Ministry of Agriculture, which provides research and extension assistance to farmers. Another supporting agency is the Saudi Arabian Agricultural Bank (SAAB), which disburses subsidies and grants interest-free loans. The Grain Silos and Flour Mills Organization was established in 1972 to purchase and store wheat, construct flour mills and produce animal feed to support the nationwide growth of agriculture. To encourage private investment in the agricultural sector, Saudi Arabia has allocated substantial financial resources for improving roads linking producing areas with consumer markets. In addition, the land distribution and reclamation program, which was introduced in 1968, aims at distributing fallow land free of charge, mostly in small plots, as a means of increasing the area under cultivation and encouraging crop and livestock production. The beneficiaries are required to develop a minimum of one quarter of the land surface within two to five years. Upon compliance, full ownership of the land is transferred to the farmer. Under the Development Plans, the government continues to assist new farmers in implementing capital-intensive projects with special emphasis on diversification and greater efficiency. To raise farm productivity, the government also funds and supports research projects aimed at producing new food crops to increase harvest and develop plant strains with greater resistance to pests. These programs are conducted in cooperation between local farmers and scientists at agricultural research facilities at Saudi Arabian universities and colleges. Saudi Arabia is a desert country with no permanent rivers or lakes and very little rainfall. Water is scarce and extremely valuable, and with the country’s rapid growth, the demand for water is increasing. 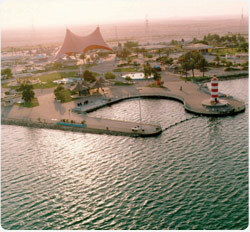 The Kingdom, therefore, has turned to innovative ways to provide enough water to support its development. All water matters are handled by the Ministry of Water and Electricity. Aquifers are a major source of water in Saudi Arabia. They are vast underground reservoirs of water. In the 1970s, the government undertook a major effort to locate and map such aquifers and estimate their capacity. As a result, it was able to drill tens of thousands of deep tube wells in the most promising areas for both urban and agricultural use. Another major source of water is the sea. This is done through desalination, a process that produces potable water from brackish seawater. Saudi Arabia is the world’s largest producer of desalinated water. The Saline Water Conversion Corporation (SWCC) operates 27 desalination stations that produce more than three million cubic meters a day of potable water. These plants provide more than 70 percent of the water used in cities, as well as a sizeable portion of the needs of industry. They are also a major source of electric power generation. Dams are used to capture surface water after frequent flash floods. More than 200 dams collect an estimated 16 billion cubic feet of runoff annually in their reservoirs. Some of the largest of these dams are located in the Wadi Jizan, Wadi Fatima, Wadi Bisha and Najran. This water is used primarily for agriculture and is distributed through thousands of miles of irrigation canals and ditches to vast tracts of fertile land that were previously fallow. An expanding source of water is the use of recycled water. The Kingdom aims to recycle as much as 40 percent of the water used for domestic purposes in urban areas. To this end, recycling plants have been built in Riyadh, Jeddah and other major urban industrial centers. Recycled water is used for irrigation of farm fields and urban parks.